Two different generations of bands devoted to near-religious musical transcendence appeared on late-night TV last night. 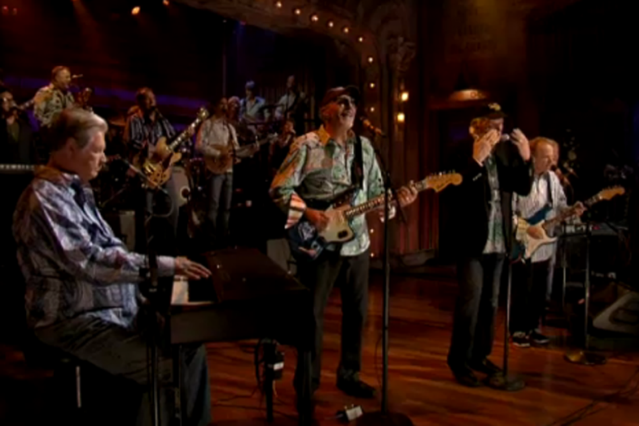 The newly reunited Beach Boys played three songs, including their new “That’s Why God Made the Radio,” on Late Night With Jimmy Fallon. Spiritualized performed on Late Show With David Letterman in support of acclaimed new album Sweet Heart Sweet Light. While the Beach Boys famously specialize in teenage symphonies to God, Jason Pierce’s Spiritualized approaches the ineffable through drugs and skuzzy, post-Velvets rock’n’roll. On Letterman last night, joined by white-clad backing singers, Pierce and his band pummeled through “Sweet Jane”-referencing Sweet Heart Sweet Light single “Hey Jane.” It was a performance in its own way no less nostalgic than the Beach Boys’, but it achieved its own sort of hypnotic rapture. And thankfully, Letterman was there to clarify that the “Huh?” seen on the cover art isn’t actually the name of the album (via the Audio Perv).